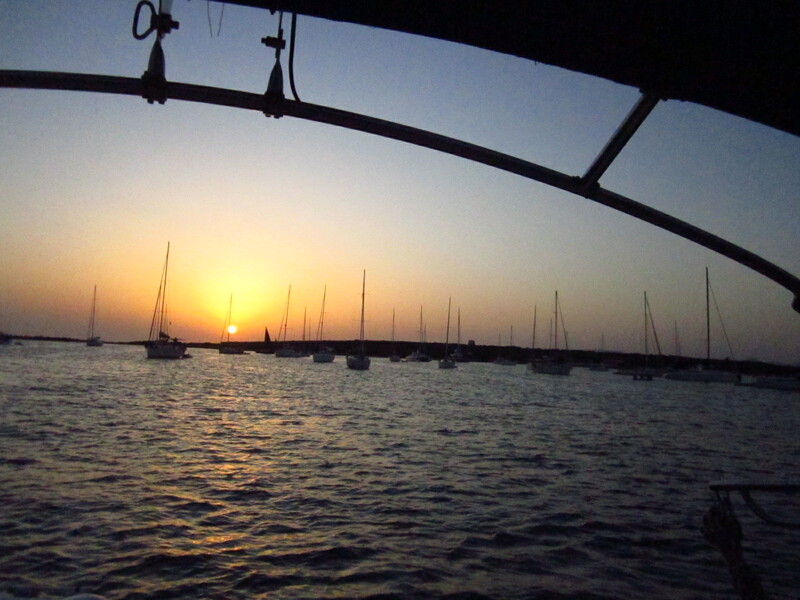 We’re again in the middle of Mediterranean night, and it’s time to tell the fairy tale about Ibiza. This Spanish island is amazingly beautiful. 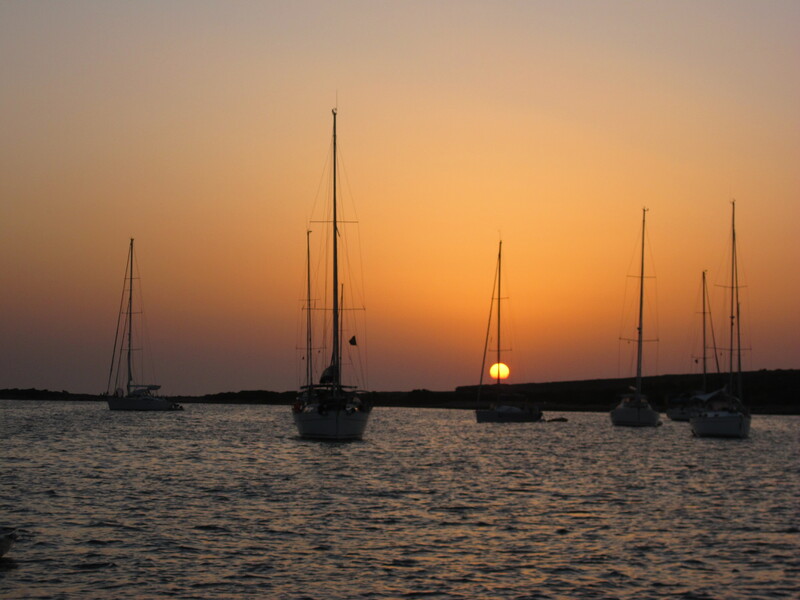 If to forget for a moment about entertainment industry and imagine the picturesque fantasy island – that definitely could be Ibiza. In the first bay, where we stop, all was awaiting the Full moon party. The small beach that doesn’t look like party place during the day at night is occupied by drummers. Sound of djembe is heard from far away and makes heart bit in rhythm. At the first evening we shared barbeque on “La Palapa”, but I couldn’t stay apart of African call and rushed to the beach. There I recalled my beloved Paris and my friends from Western Africa – I miss them dearly and will be back with my djembe one day to play on steps of Sacre Coeur again. The second bay gifted me amazing snorkeling! This was the most charming underwater garden I’ve ever seen! Like flowers and lianas, white and green sea plants cover the rocks that are dotted with numerous grottos. Fish of all sizes and colors feel themselves free and safe there, and even small jelly fishes were playing, chasing each other. I was lucky not to step on the nest of sea hedgehogs, while exploring the cave under the rocky coast. In the third bay, where we stopped, Luis at the same moment noticed “features” of upcoming party. And he was right! The evening we spent on the beach, drinking wine on shezlongs that were more familiar to sofas. “Soft” interior and pictures on walls, green trees with sofas-bed under them created the atmosphere. But most of all we loved the toilet with warm wet towels a la Japanese restaurant! This bar, probably, not the best place for active party people but definitely pleasant place to spent evening with friends (if ready to spend some amount of euros). And completely in style of relaxed Ibiza! I don’t remember when the last time I spent my days so lovely way. We made a walk across the park to the ancient tower on the cape of the island. 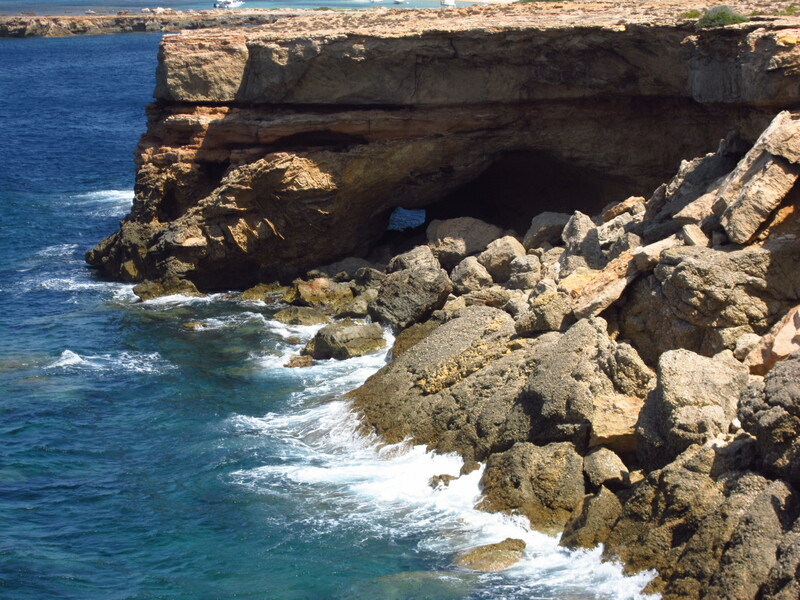 “The park” on Formentera is a dry land, covered with scarce bush and grass, bordered with stone fences or natural cliffs, going down to the sea. At the entrance there’s a kind demand not to disturb local lizards. Near the beach – dry lake with some “healthy” mud on the edge – popular touristic spot. I wonder: if this mud is really healing or people have just found another entertainment for themselves? Next days visited the town nearby (as internet-addicted people can’t stay apart of the net for a long time) and roasted on a beach for a while – another lovely leisure I haven’t done for ages.